My sports banners are created as composites. Each player is shot individually in the studio. Those images are digitally cutout in Photoshop, and placed on the digital design for that team. The designs are created in advance and the teams select from what we have already created, or give me ideas of things they want implemented in their design and we create from scratch. Some of my designs are templates, others are complete originals and some are a combination of the two. I will often use an element from a template for use on a new design. 90% of my portrait business is somehow related to my sports banners. Teams display the banners at tournaments and games. My website is always on the bottom right corner of the banner for everyone to see. A lot of my inquiry calls begin with, “I saw one of your banners at a tournament”. The families of the players often come in for family sessions or senior sessions and or refer me to a friend or family member. The banners also get posted on Facebook so a lot of the players families and friends will see them there and contact me through Facebook. Almost all of my clients, can somehow be linked back to a banner. 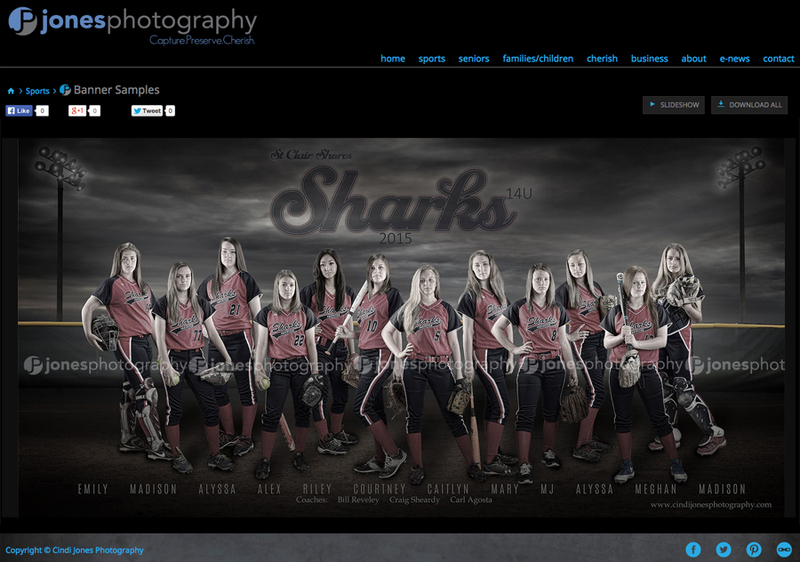 Click here to see examples of Jones Photography Sports Banners. The senior magazine was designed to give the seniors and parents a tangible item that held the answers to almost all of their questions. Something they could refer back to and make notes in if needed. It provides them with all of my paperwork, tips, step by step instructions on what they can expect and how to prepare for their session to get the most out of their experience. The magazine was just launched last week and so far there has been a lot of great feedback. Certainly there will be improvements made over time but it is a great starting point and the families are really going to appreciate it. Perspective clients get a bit of the information but in order to receive the hard copy, they must pay their session deposit. That keeps the print costs down. Click here to view the Jones Photography 2016 Senior Magazine. Visit Jones Photography to see more of Cindi’s work.